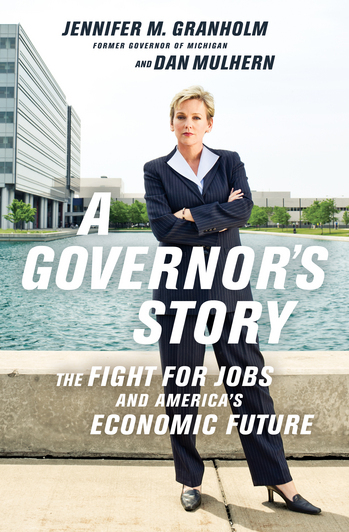 Posted on Sun, Jan 22, 2012 : 5:59 a.m.
From the book A Governor’s Story by Jennifer Granholm and Dan Mulhern. Reprinted by arrangement with PublicAffairs, a member of the Perseus Books Group. Copyright (c) 2011. “Hey, Jennifer, how are you doing?” I was in my car the morning of January 22, 2007, and the friendly voice on my cell phone belonged to Jeffrey Kindler, CEO of Pfizer, the pharmaceutical company, phoning from New York. Kindler was a fellow Harvard grad who’d held a fund-raiser for me during my reelection campaign. “It’s one of those ‘be careful what you wish for’ moments,” I continued, with a small laugh. Then I grew serious. “Actually, Michigan’s situation right now is astonishing. I’m grappling with the loss of manufacturing jobs because of globalization, a massive budget hole, a really tough downsizing process. But, hey, I’m sure you’ve faced similar struggles at Pfizer,” I said. “Jeff,” I heard myself almost panting, “is there anything we can do to keep you here? More tax breaks? Anything?” I was grasping for a lifeline. “This goes well beyond taxes,” he said. “It’s about generic drugs coming online. We have to reduce our global footprint. It has nothing to do with Michigan. We’re closing facilities around the world. I’m so sorry,” Kindler said again. I hung up the phone and immediately called David Cantor, who headed up Pfizer’s enormous labs in Ann Arbor. Cantor had been a close ally of mine, a champion of the entrepreneurial culture spreading through Ann Arbor, a vocal spokesperson for Michigan’s move toward life sciences, and a business advocate for my core revitalization strategy. Ann Arbor and Kalamazoo had been key cities in our Life Sciences Corridor initiative, with much of the planned development coming from Pfizer. This news would devastate both communities. “David, were you part of this decision?” I asked, still trying to comprehend the magnitude of what was happening. As I hung up the phone, I looked out the car window. We’d stopped on Liverois Avenue in Detroit, next to a vacant lot. I sat there, lost in thought, watching as fragments of trash blew up against a chain link fence. My God, I thought, when will we catch a break? Mon, Jan 23, 2012 : 5:05 a.m.
&quot;"This goes well beyond taxes," he said. "It's about generic drugs coming online.&quot; So basically Pfizer is saying, we can only compete if we have a monopoly on a drug. The spend millions marketing the drug to doctors, who then prescribe it to people for free trips and nice dinners. Yeah that's the ticket. Has Pfizer paid back ANY of the tax abatement they were given to begin with? <a href="http://www.siteselection.com/ssinsider/bbdeal/bd011210.htm" rel='nofollow'>http://www.siteselection.com/ssinsider/bbdeal/bd011210.htm</a> By the way, the governor who gave the tax abatement was not Granholm. It was Engler. ' Pfizer has proven time and time again they can not compete without corporate welfare From October of 2011 <a href="http://www.theday.com/article/20111014/BIZ02/310149911/1018" rel='nofollow'>http://www.theday.com/article/20111014/BIZ02/310149911/1018</a> October 2009 <a href="http://www.cbsnews.com/8301-505123_162-42843244/pfizer-closes-bridgewater-site-clock-ticks-on-ct-tax-deal-layoffs-all-over/" rel='nofollow'>http://www.cbsnews.com/8301-505123_162-42843244/pfizer-closes-bridgewater-site-clock-ticks-on-ct-tax-deal-layoffs-all-over/</a> Way back in 1998 ( I guess that generic crisis has been around a LONG time. <a href="http://www.pharmalot.com/2011/02/pfizer-tax-incentives-and-jobs-worth-the-price/" rel='nofollow'>http://www.pharmalot.com/2011/02/pfizer-tax-incentives-and-jobs-worth-the-price/</a> I hope there is a Pfizer liquidation in the near future. Sun, Jan 22, 2012 : 6:40 p.m.
Cantor had nothing to say about it. I believe he was honest and as devastated as anyone. It was clear to me from things he'd said before the closing that he expected to be here a long time. Sun, Jan 22, 2012 : 6:24 p.m.
Why not do a story about the rumor that U of M rebuffed Pfizer when they asked to buy the campus back? And please do not delete my comment again, and I would like to know why it was erased the first time???? Sun, Jan 22, 2012 : 5:32 p.m.
who? nice facial photoshop on the book cover. Sun, Jan 22, 2012 : 4:58 p.m. The fact is no business leader listened to Jenny. Comerica, Pfizer etc. all ignored her because of her far left radical views. Pick and winner and subsidize with tax money is not a practical way to run a state or a businees. We will spend the better part of 6 years fixing all her mistakes. Sun, Jan 22, 2012 : 3:28 p.m. I can't recall a single good thing Granholm ever did for Michigan. A governor of the auto capitol of the world, yet she does not know how to drive a car and does not have a drivers license. Sounds like a sliver of truth in there they did close; the decision was made in November but not announced until after Granholm was sworn in, most of the business along the plymouth road corridor recieved the news in December. Her spin on situtions is amazing! Sun, Jan 22, 2012 : 1:03 p.m. Here is another version: Although a fellow Harvard grad, we did not know each other. Jeff had contributed to my campaign, but Michigan fought Pfizer hard and in public for Medicaid drug payments the previous year. It helped my reelection to win that battle, but Jeff decided I was not a supporter for Pfizer in Michigan. When he heard I had won, that is when he decided to pull Pfizer out of Michigan. After 4 years of me in office and no changes in favor of business, Pfizer was truly blown away! Sun, Jan 22, 2012 : 12:32 p.m.
Sun, Jan 22, 2012 : 11:18 a.m.
"Jeff," I heard myself almost panting, "is there anything we can do to keep you here? More tax breaks? Anything?" That's right Jennifer, and every other tax give away politician, offer more of what's not yours to give to your corporate friends, funding phantom jobs. Back in 2002 or so, I recall you were cutting the life-science grants from $56 million to $28 million, and the first one to complain was Pfizer, given they were the biggest recipient. They said that a measly $28 million wouldn't make it worthwhile to even set up an accounting structure. The next thing we know, you upped the amount to over $500 million and Pfizer began buying up competition, consolidating and closing facilities. Michigan politicians, especially governors, like being gamed, and in turn they like gaming the people.